Enter for your chance to a win passes for two to a special Advance Screening of DESPICABLE ME 3 at AMC Altamonte - 433 E Altamonte Dr, Altamonte Springs FL 32701, on Tuesday June 27th, 2017 at 7:00PM. 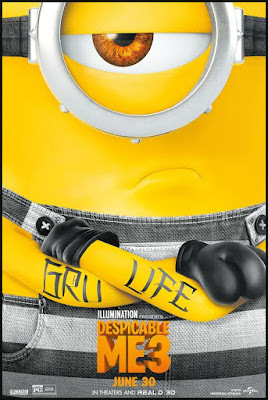 Illumination, who brought audiences Despicable Me and the biggest animated hits of 2013 and 2015, Despicable Me 2 and Minions, continues the adventures of Gru, Lucy, their adorable daughters—Margo, Edith and Agnes—and the Minions in Despicable Me 3. DESPICABLE ME 3 is in theaters on June 30th, 2017. NO PURCHASE NECESSARY. Limit one (1) admit-two pass per person. Must be 13 years of age or older to win passes. Employees of all promotional partners and their agencies are not eligible. Void where prohibited. Entries must be received by 6/23 to be eligible to receive pass. Winners will be contacted via e-mail to receive their pass. SEATING IS LIMITED, SO ARRIVE EARLY. PASS DOES NOT GUARANTEE A SEAT AT THE SCREENING.